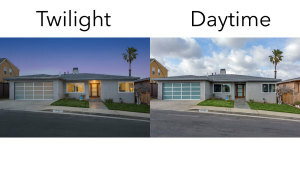 You are here: Home > Twilight Photography: Does my listing need it? One of the most common questions we’re asked on a daily basis is whether or not an agent or broker should add twilight photography to their marketing package. For 90% of homes on the market, the answer is yes. The most important photo of a home is the shot that will be used on your printed marketing materials and image 1 on the MLS. 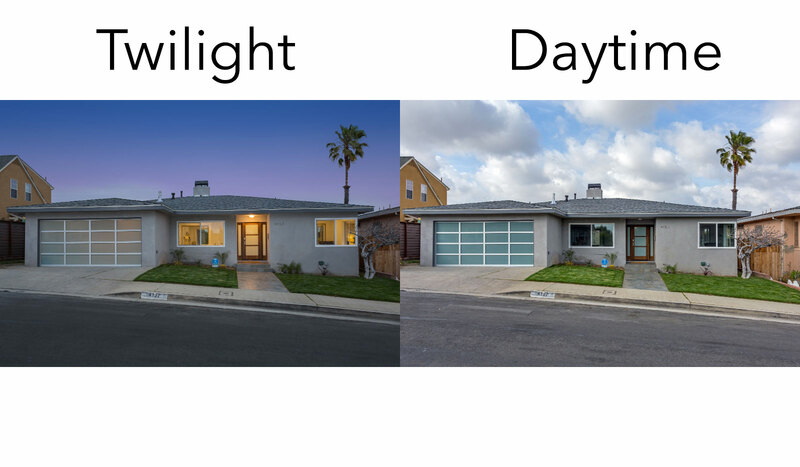 Most listings rely on a daytime exterior photo, but that same house can look dramatically different at night. Here’s a quick example of just how dramatic the difference can be. The daytime shot was done at 5pm, the twilight shot was done at 6pm (approximately 20 minutes after sunset). In order to get the most out of a twilight photo shoot there are a few items of preparation that should be followed. First, check all the exterior lights at the property. This includes any outdoor patio, pool or spa lights that should be illuminated in the final image. It may sound obvious, but you’d be surprised how many times we find out the exterior lights either don’t work, or only turn on with a timer/sensor. If the lights are on a timer, you’ll want to make sure that it can be overwritten. If you’re ready to make your listing stand out from the competition or simply looking to impress at your listing presentations, twilight photography will get the job done.